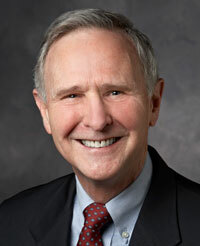 Eric A. Hanushek is the Paul and Jean Hanna Senior Fellow at the Hoover Institution of Stanford University. He is also Chairman of the Executive Committee for the Texas Schools Project at the University of Texas at Dallas, and a member of the CALDER Management Team, leading the CALDER Texas work. He is chair of the Board of Directors of the National Board for Education Sciences, a Research Associate with the National Bureau of Economic Research, and a member of the Koret Task Force on K-12 Education. Dr. Hanushek has been a leader in the development of economic analysis of educational issues with a special emphasis on the determinants of student achievement. His research spans the most important areas of education policy including the importance of teacher quality, the impacts of high stakes accountability, and the value of class size reduction. He was the first researcher to measure teacher effectiveness by the learning gains of the teacher's students. This work is the foundation of the now-common approach to assessing teacher quality by the "value-added" of the teacher. In other work he has shown that cognitive skills are very closely related to economic outcomes, not only for individuals but also for nations. Variations in growth rates across countries can be largely explained by consideration of the role of cognitive skills. This analysis provides a justification for state and federal accountability systems that promote higher skills through improved school quality. His books on education include Courting Failure: How School Finance Lawsuits Exploit Judges' Good Intentions and Harm our Children, Handbook on the Economics of Education, The Economics of Schooling and School Quality, Improving America’s Schools: The Role of Incentives, Making Schools Work: Improving Performance and Controlling Costs, Educational Performance of the Poor, and Education and Race along with over 200 professional articles. Dr. Hanushek's government service includes posts as the Deputy Director of the Congressional Budget Office, Senior Staff Economist for the Council of Economic Advisers and Senior Economist for the Cost of Living Council. Dr. Hanushek is a Distinguished Graduate of the United States Air Force Academy, where he earned his B.S. degree. He received his Ph.D. in Economics from the Massachusetts Institute of Technology (M.I.T.). Performance testing in schools: Is tested too much? 50 years ago, one report introduced Americans to the black-white achievement gap. Here’s what we’ve learned since. How much income tax do Oregon schools get? The closing of the military mind? How Do You Fix Schools? Maybe Just Give Them More Money. Does it even matter if Americans are terrible at math?